Have you ever needed to know the N rate for corn that will maximize return on investment but didn’t have access to A2809 Nutrient application guidelines in field, vegetable, and fruit crops in Wisconsin? Have you ever wanted to make a quick price comparison of N fertilizer materials, but didn’t feel like thinking about the math? If you answered yes to either of these questions, then you’ll be glad to know that the NPM program has an app, actually two, for that. The apps are available for free in the iTunes store. See the following websites for more details. 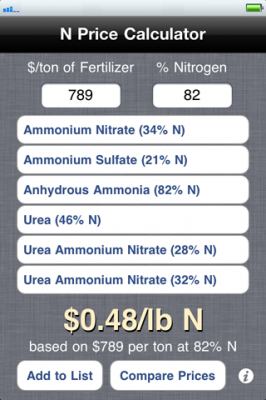 The free N Price calculator app allows you to compare the price of various forms of nitrogen fertilizer products in terms of their price per pound of nitrogen.Nitrogen fertilizers such as anhydrous ammonia, urea, and urea ammonium nitrate (UAN) vary in their nitrogen content and are sold on a price per ton basis. 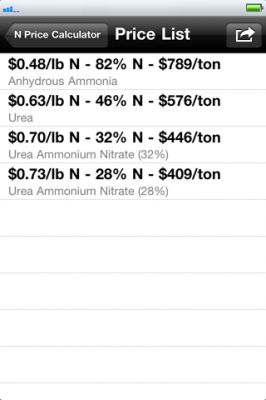 This app converts the price of each fertilizer product from price per ton to price per pound of nitrogen — allowing for “apples to apples” comparisons. 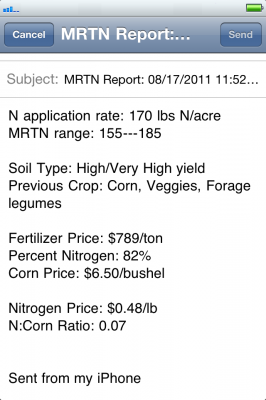 By comparing the price per pound of nitrogen from multiple fertilizer sources on the N Price Calculator’s Price List, the cheapest source of nitrogen can be identified. 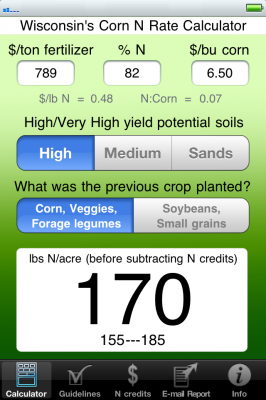 View the Corn N Rate page on this website for instructions on how to use this app. The MRTN guidelines are designed to assist producers in selecting an N rate that improves profitability when N and corn rates fluctuate. Maximum return to N (MRTN) is the N rate that will be most profitable for a particular N:Corn ratio. The MRTN rate is the LARGE number expressed in lbs N/acre (total to apply) including N in starter. Below that number is the range of N rates that result in profitability within $1/acre of the MRTN rate.